Sometimes you read a story that knocks you off your axis, so unbelievably amazing that you’ll never be prepared for the force of feels that strikes from this journey you’ll forever feel. All Your Perfects is a book I never expected to knock me off my axis, but one that hit my heart so hard as it struck my soul. 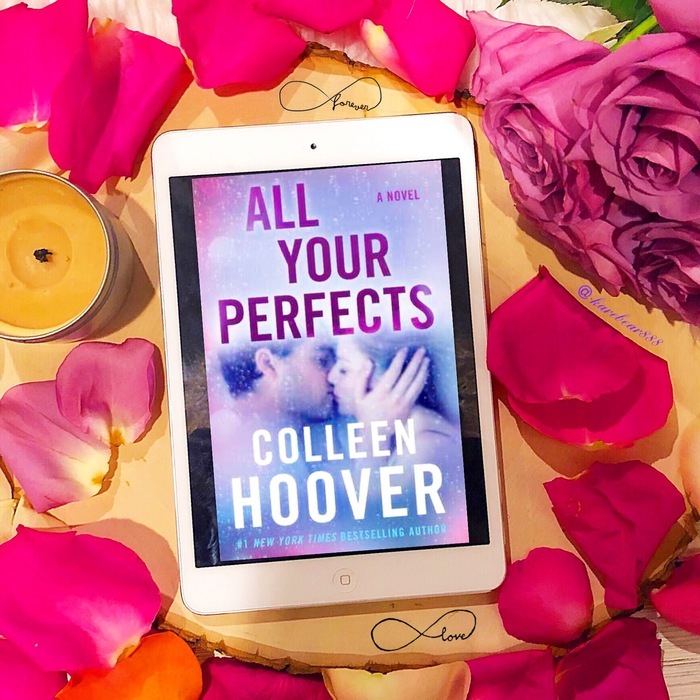 Colleen Hoover takes a deep dive into marriage territory with All Your Perfects, a book so broken, so brutally honest, and so beautiful that it nearly brought me to my knees. All Your Perfects broke me in the best way and BLEW ME AWAY! Emotionally rich and relatable, All Your Perfects connected to me from the start, one that tore at my heart with words that stole my soul, stomping on it with each breath. I was ENRAPTURED with this story! I WAS RENDERED POWERLESS to All Your Perfects’ power—this force of feels that awakened everything inside of me. My heart both raced and ached, beating so hard yet breaking so hard too. I wanted to hug someone. I wanted to punch someone. I wanted to sob for everyone. I cried for everyone. I felt it all. It’s strange how I can miss a person who is still here. No marriage is perfect. Through All Your Perfects, Colleen Hoover shines a light on the imperfections, struggles that many couples face, and brings an emotional depth that it is so real that it’s sometimes hard to read. Told through a struggling wife of a heroine, All Your Perfects shows the imperfections of marriage—the ups and downs, and the storms under the umbrella of love—and makes you feel every emotion this couple endures. All Your Perfects is so achingly honest and personal that it feels like an invasion upon reading. Deep. Dynamic. Devastatingly beautiful.I could not help but feel every emotion that this hero and heroine did. Their marriage became mine too. Ironically, my husband of almost 24 years, my teenage love, and I had a fight shortly before I picked up All Your Perfects to read. The fight wasn’t major but it still was meaningful. Reading this story, though the particulars are different, emphasized both a struggle and a triumph I already knew: Marriage is your home that’s sometimes hit with hurricanes. You have to do your best to weather those storms, putting everything you have into saving your home. That’s what All Your Perfects is about: weathering those storms while holding onto and fighting for your home—all while remembering the foundation of your home and the glue that holds you together. Without the rain, there wouldn’t be rainbows. The imperfects make the perfects more meaningful … more real … more everything. I’m not sure anyone had ever made me feel as beautiful as he makes he feel when he looks at me. No one writes complex relationships in the most raw and real of ways—messy love at its best—like Colleen Hoover. No one. A deep dive into marriage territory that tackles tough issues, All Your Perfects is about as real as you can get. It’s so believable, so broken, and so breathtaking that I couldn’t put it down. It may just be my favorite book of this author’s to date. Colleen Hoover has truly outdone herself in All Your Perfects, a tear-jerking journey of marriage that shines an honest light on the perfects and the imperfects, and stamps a forever mark on the heart and soul. All Your Perfects is EXTRAORDINARY, an EMOTIONAL JOURNEY that has left a lifelong mark on my heart and soul. This soul stunner of a story turned me into a bawling baby where I sobbed so hard that I shook like an earthquake. I seriously cried straight up UGLY TEARS, tears that touched my kindle. All Your Perfects is ALL THE THINGS! It wowed the woman in me. It wrecked the wife in me. It’s gripping. It’s gut-wrenching. It’s messy. It’s moving. It’s meaningful. It’s broken. It’s beautiful. It’s so raw that it feels real. All Your Perfects is a Category 5 hurricane that hit my heart so hard that I felt every word of this emotional journey, one that wrecked me in the most wonderful of ways. I felt everything in a story that’s everything. All Your Perfects is EVERYTHING!!! A TOP 2018 & LIFETIME READ!